This road is the great thoroughfare from Los Angeles and San Bernardino to the great gold and silver fields now known to exist and which at present are being worked, east of the Sierra Nevada and Coast Range Mountains. And not only this, but over it all the travel from the north, not passing over the San Fernando Mountain, going southward, must pass. At the head of the cañon is one of the steepest mountains in the State, over which a road passes, and teamsters have always complained of the great difficulties encountered in the ascent. So severely has this been felt, that many of them have offered $5 a load toll to any parties who would cut down the mountain and make a turnpike road of it. As the travel on this road has been greatly increased of late by the trade to the mines, it has become absolutely necessary to take steps to improve the mountain pass road. For this purpose subscription lists have been circulated this week here and in San Bernardino, to raise money to cut down the road across the mountain, and thus facilitate transit to the mines. Although it is not clear from this article, there were actually two separate roads under review. One would connect the mines at Holcomb Valley with Cajon Pass by traversing down the north slope of the San Bernardino Mountains, and this was the one to be constructed with funds obtained from subscriptions. The other road was proposed to go through the pass and link the desert to the valley, and was to be built as a private venture for the purpose of collecting toll. On April 20th, the Star reported that prospective subscribers for the Holcomb Valley road had appointed a committee consisting of prominent Cucamonga citizen John Rains, freighter W. T. B. Sanford and Los Angeles merchant Francis Mellus, who had examined the road and had returned with recommendations for alternative alignments. The cost was less than the $2,000 previously estimated, and it turned out the amount needed had already been collected. Elsewhere in the same issue of the Star, an article stated that Jed Van Dusen, the miner who later built the Holcomb Valley road, had been over the proposed route a second time, and he felt it was much better than he originally had supposed. Meanwhile, on April 17th the state had passed legislation entitled, "An Act to Authorize the Construction of a Wagon Road in the Cajon Pass," which gave John Brown, Henry M. Willis and George L. Tucker the right to construct a road and to collect toll for its use at rates to be determined each year by the County Board of Supervisors. Work began immediately under a contract granted to Sydney P. Waite, Horace C. Rolfe and David N. Smith, who directed a crew of 30 to 40 workers. The job before them would not be easy, since the route went through some very difficult terrain. 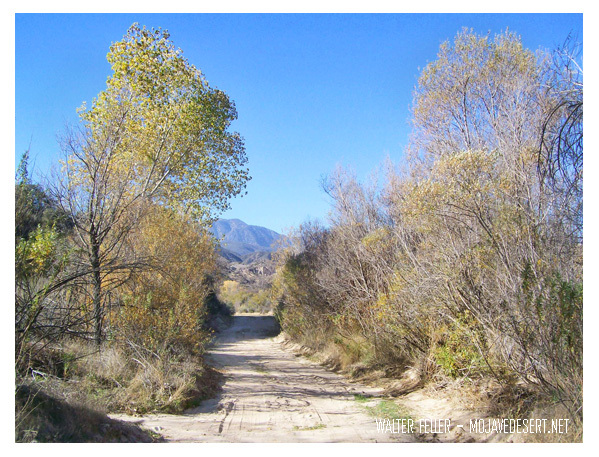 The road began at Martin's Ranch near present-day Devore and traversed Cajon Canyon. Partway up the canyon, at what is now Blue Cut, was the narrowest segment of the lower portion of the road, known at that time as the "lower narrows." Continuing up the canyon along the bank of the creek, the road entered a ravine currently called Crowder Canyon, but known as Coyote Canyon in pioneer times. Shortly after the completion of the turnpike and Van Dusen's road, Mellus hired the freighting firm of Banning and Hinchman to move a boiler weighing 8,000 pounds from Los Angeles to Holcomb Valley. The boiler was to be used at the quartz mill, where they crushed the ore. There were differences of opinion on whether the monstrous apparatus could be hauled over the mountains, but under the direction of the capable Sanford, the feat was accomplished. The wagons left Los Angeles on the 17th of July and arrived at Holcomb Valley on August 13th. This had been the first major challenge for Brown and his road, and he had done everything in his power to assist Sanford in his efforts. The Los Angeles Star, reporting on their success, said, "All wagons from Los Angeles and San Bernardino now go by the turnpike -- the old Spanish trail, made into a good wagon road, having grass and water within easy distances."